Black Swan is a dark and disturbing look into the world of ballet. Admittedly that does have an air of humor about it when you give it some thought but it reality this film takes you on an unexpected journey into the mind of a young girl completely naïve to the world she already inhabits. The stars Natalie Portman as Nina, a young talented ballet dancer working in New York City and hoping, like all the other girls, to be cast as the Swan Queen in the newest production of Swan Lake. It's clear right away that her life is anything but ordinary; from her over bearing mother, to the possibility that she hurts herself in her sleep, her state of mind is something that is always in question. At a recital one day the director of the ballet, Thomas (Vincent Cassel) selects a number of girls to try out for parts in the play. Nina is thrilled to be picked but during her tryouts she struggles to portray the roles of white and black swan. Her dancing is tight and frigid, as commented by Thomas, and as much as she tries she can't access that inner fire. In a surprise turn of events she gets picked for the lead role. Of course as much excitement as this brings, Nina now feels the mounting pressure that comes with it. It doesn't help that the other dancers covet her position, one in particular named Lily, played by Mila Kunis, seems very friendly to Nina but in such a competitive world it's hard to tell who you can trust. As the production gets under way and Nina can't seem to tap into the darker, more lustful part of herself that is required for the black swan the director increasingly loses his patience with her. Nina's fragile state of mind continues to crack and she starts to hallucinate, thinking she is seeing a shadowy version of herself in mirrors, on subways, even on a night out with her so-called friend Lily. As the date of her performance looms closer Nina is unable to perform, to the tastes of the director and it begins to look as though she may be recast in the role. Events reach a crescendo on opening day, and to try and explain or give away what transpires, for those of you who have not seen this film, would be in poor taste. Suffice it to say Natalie Portman definitely deserved the Oscar she won for this role. The film is now on Blu-ray in a 2-disc set packed with some interesting extras. The first disc contains 4 featurette's; the first takes a look behind-the-scenes of the film with the director, Darren Aronofsky, showing how they put together such a complex ensemble for audiences. The next feature takes a look at the ballet itself and its influence on the costumes and production design. The next looks at the long road to making this movie, how Natalie prepared for the role and learned how to dance. The last feature looks at the cast individually, highlighting their careers and the rewarding roles they have had over the years. Also on disc one is Live Lookup powered by IMDB.com and another behind-the-scenes look, this time with brand new exclusive footage; lastly there is a Wi-Fi capability for those who wish to transfer those extras to their smart phone so they can enjoy them on the go. Disc two is fairly straight forward with a digital copy of the movie if you wish to transfer it to a portable media player so you can bring the movie with you anywhere. All in all these extras combined with an excellent movie make for a very enjoyable movie experience. Download Black Swan from the iTunes Store in Digial HD. 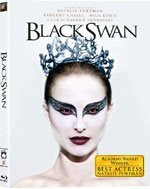 For more information about Black Swan visit the FlickDirect Movie Database.